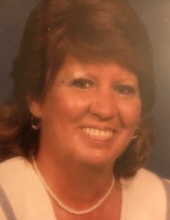 Ms. Peggy Diane Foster, age 72 of Wilkesboro, passed away Thursday, April 04, 2019 at Westwood Hills Nursing. Private family services will be held at Scenic Memorial Gardens. Ms. Foster was born April 12, 1945 in Wilkes County to William E. Foster and Nellie Ashely Foster. She was retired from Royal Castle Restaurant in Clearwater, FL. She was preceded in death by her parents and a brother; Jerry C. Foster. Ms. Foster is survived by two sons; Clay Foster and wife Kathy of Taylorsville and Dennis Johnson and wife Michelle of Eutawville, SC, three grandchildren; Tosha Hall of Thurmond, Christy Foster of Traphill and Heidi Johnson of Eutawville, SC, three great grandchildren; Maggie Hall of Thurmond, Kolby Foster and Braden Foster of Traphill and a sister; Bonnie Johnson of Wilkesboro. To send flowers or a remembrance gift to the family of Peggy Diane Foster, please visit our Tribute Store. "Email Address" would like to share the life celebration of Peggy Diane Foster. Click on the "link" to go to share a favorite memory or leave a condolence message for the family.